As a continuation of last year’s work on a proof-of-concept app design, the student project Wicam moves forward in the direction of integrating wearable technology, a helmet camera in particular, with the Ach so! tool. This year the development is continued by a new student group that will work from where the previous team left off. In addition to the development of the app itself, the students achieved an even higher accomplishment and negotiated testing their prototype in one of the biggest construction companies in Finland. HelmetCam is an Android prototype app designed to explore the interoperability of GoPro helmet camera with Ach so! tool. It uses all the functions of the Ach so! 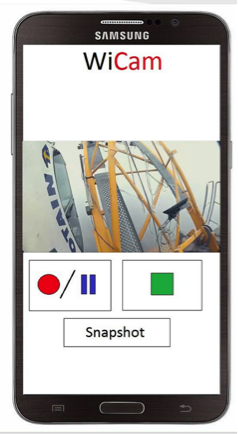 app to record video material on site. The benefits are seen in liberating the hands for the workers in favour of using them for other tasks, while keeping the helmet on and video documenting the necessary material. In the project the involved partners are: AALTO from Learning Layers as customer; end-users to whom student team design are learners in vocational construction training and fieldwork. The student team is from Helsinki Metropolia University of Applied Sciences (see course description).